Oligonucleotides are assembled via solid phase synthesis. Thereby nucleotides are attached according to the sequence of choice leading to chain-growth. It is generally known that chemical reactions never get at 100% conversion. In state-of-the art oligonucleotide synthesis coupling yields of 99.5% are achieved. With the unreacted 0.5% of the strands, chain assembly stops and truncated sequences form as side products. Depending on the intended application it is advantageous to remove these shorter sequences from the full-length product. 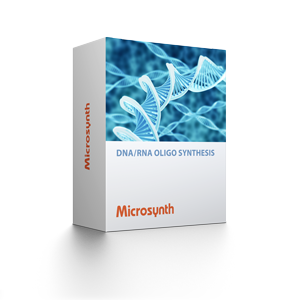 Therefore, Microsynth offers various types of purification methods. All our oligos are at least desalted to largely remove residual low molecular by-products arising and accumulating from the frequent chemical reactions during synthesis. Such purification is sufficient for oligonucleotides shorter than 30 and/or oligonucleotides used for non-critical applications such as PCR, sequencing, probing, mobility shift or hybridization. However, desalted oligos are not recommended for use in molecular cloning projects. Oligos <50 bases in length can be well purified via Reverse Phase HPLC. Through this purification approach, preferably residual, n-x truncated oligos (lacking the hydrophobic DMT protection group at the 5’ end) are removed. This results in a ≥85% purity of the targeted oligonucleotide. RP-HPLC is useful for a higher level of purity required for more demanding applications such as cloning, DNA fingerprinting, real-time PCR, FISH, etc. Dialysis as an add-on to HPLC is recommended if oligos need to be present in a physiological state. When performing in vivo experiments (e.g. in mice) this purity level is strongly recommended. Polyacrylamide gel electrophoresis (PAGE) purification is generally necessary for long oligos (>50 bases) and for all those primers with critical 5' sequences (restriction endonuclease sites, RNA promoters). It is the best method to differentiate full-length oligos from aborted sequences (n-1 oligos), based on size, conformation and charge. PAGE purification has an excellent resolution and yields a product that is, on average, ≥95% pure. In this context, it is important to note that the purity level declines with increasing length of the oligonucleotide, and this is particularly true for oligos up to 120 bases. PAGE purification is highly recommended for sensitive experiments such as cloning, mutagenesis, DNA fingerprinting, in situ hybridization, gene synthesis, etc. 2 Guaranteed and average yields in OD are valid for unmodified oligos >20mer only. 3 Yields indicated in nmol represent an example calculation for a 20mer. For this calculation the following rule of thumb equation was applied: nmol of oligo = OD x 100/length of oligo. Please note that this calculation is based on sequences with virtually homogenous distribution of the 4 DNA bases; it may vary for sequences with high GC contents >70% etc. 2 Guaranteed and average yields in OD are valid for unmodified oligos >20 and <40 nucleotides only.